The Perfect Turkey Dinner for Your Family. Thanksgiving is synonymous with turkey and since it is right around the corner, you can bet that like most Canadians, I have visions of a gorgeous table set for family and friends, laughter and of course, juicy turkey with all the fixing’s and even leftovers on my mind! Every year, we cook a big juicy bird with mashed potatoes, gravy, stuffing, veggies and pumpkin pie. Turkey is always the centerpiece, the star, and with good reason. It’s no wonder that there’s often a fight for the turkey legs! Dinner is always hosted at our house and cooking the meal for loved ones is just as much a part of enjoying the holidays as it is sitting down and digging in to the fruits of our labor. Whether you are hosting a large group or just making dinner for two, preparing the perfect meal for your family’s needs doesn’t have to be difficult. Turkey is so versatile and tastes great with different flavours and spices. Nowadays, you can head to your nearest grocer and find different cuts of turkey. This gives you a variety of options if cooking an entire bird just isn’t practical for your family. 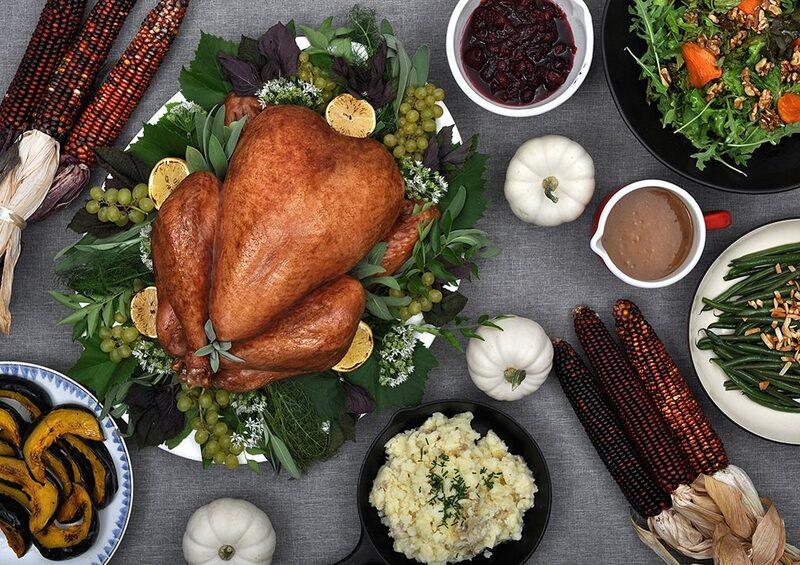 With many options, it makes turkey the perfect solution for any family get-together; why not make it a tradition? Though, I must say, there are also benefits to cooking the whole bird. If you’ve never roasted a whole turkey before, don’t worry. Canadian Turkey has whole bird how-to’s that are foolproof. You’ll be shocked at how simple it can be to create that perfect centerpiece with the help of their tips and easy-to-follow directions. We have a small family but, we always opt to cook the whole bird. The only reason why is because, leftovers. You can make lots of recipes and feed your family for the week or even freeze meals for later. Don’t forget, bones make an excellent stock for soup and you can prepare and freeze soup too. If you’re stumped on what to do with your leftovers, Canadian Turkey has a gold mine of ideas in their recipe section. One of our favorite ways to eat leftovers is a tradition we have had for generations. After we have a traditional turkey dinner with family, we use leftovers and make incredible “panes con pavo” which are turkey sandwiches or buns with turkey. It’s shredded turkey basted in a Latin-inspired, tomato-based sauce, placed in a delicious bun with lettuce and radishes. We sometimes add soft Latin cheese and it’s to die for. You can always find a delicious new recipe to inspire you or just substitute turkey for the main protein in your favourite dish. After all, what busy family doesn’t love an easy bonus meal? Another great way to use turkey is in salads. This Warm Turkey and Root Vegetable Salad with Goat Cheese Dressing is a great place to start. Whether you buy a turkey breast to make this salad at the grocer or use leftovers from the whole turkey itself, it is sure to please. A delicious salad made with roots and Canadian turkey that can be enjoyed as a main entree or light lunch. Wash, peel and roughly chop vegetables. Place vegetables on a baking tray. Season with olive oil, salt and pepper. Set oven rack to the middle position. Broil vegetables until browned and cooked through, 15 – 20 minutes. Mix together all dressing ingredients except cheese and whisk together. Break cheese into small chunks and add to dressing. Combine greens, top with roasted vegetables and walnuts. TIP: Double the turkey in this recipe to create a main dish, great for lunch or a light dinner. However you celebrate, the most important part is that you enjoy good company, good times and great food. Having options is always a bonus and when you can make more meals out of one–it’s even better! 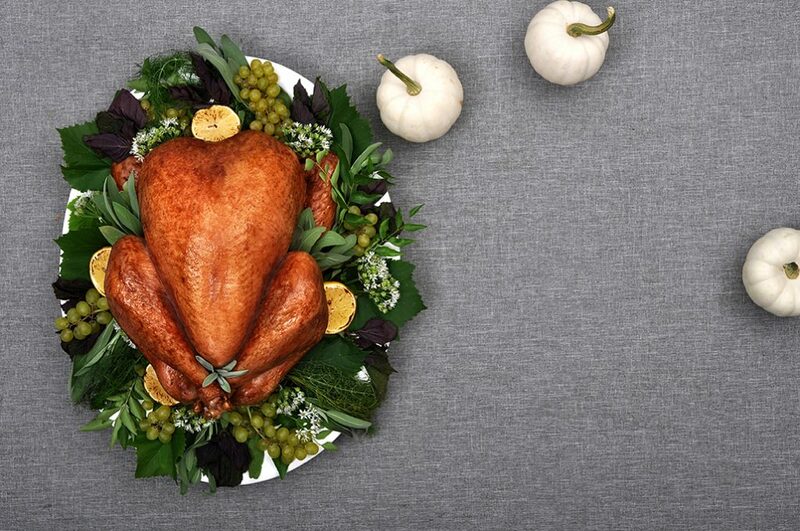 If you’re looking for more unique Thanksgiving solutions, visit the Canadian Turkey site to find the perfect recipe and create your own Thanksgiving tradition! Did you know that that for 8 years in a row, Turkey Farmers of Canada and its member organizations have donated to Food Banks Canada for the purchase of turkey by rural food banks at Thanksgiving? That is incredible! Be sure to follow them on Facebook, Twitter, Pinterest and Instagram for their latest updates, recipes and more. 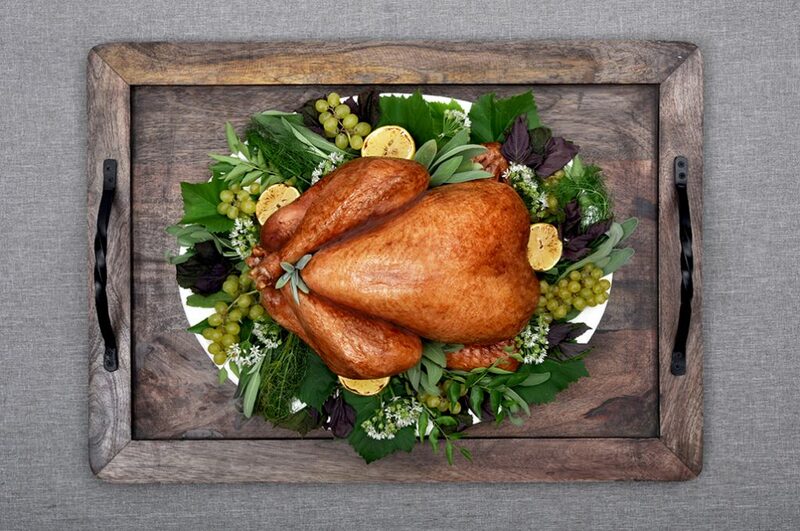 What is your favorite way to eat turkey? I think this year, I am going to try to make the Roasted Turkey with a Mustard Gravy. I am hoping that the gravy will add just the right variety to the meal and give some different that the usually gravy.. This would be my choice CHEESY TOMATO AND TURKEY BAKE because its all the ingredients my family loves. The smoked turkey wraps would provide a great meal solution for my family as it would be quick to make and something the whole family would enjoy. My tip for cooking a whole turkey is to pull the skin away from the breast meat the best you can and then rub the meat with a butter/herb mixture to help infuse some flavour right into the meat. The turkey wraps are a meal solution for us because they are quick and easy to make. And can be wrapped and taken on the go. The Weeknight Buffalo Turkey Tacos offer a great meal solution for my family as they are super quick to put together and offer flavours my entire family love! My secret is to buy a fresh turkey. Smoked turkey wraps are perfect for my family because we can each customize them to our taste. My best whole turkey cooking tip is to rub butter into the skin before you start cooking in so it crisps up nicely. The turkey mango salad sound amazing will be using my leftover turkey to make it. GRILLED TURKEY BREAST WITH MUSHROOM AND WILD RICE STUFFING, ingredients the family loves and it just sounds/looks tasty. my tip is to lay bacon on top of the turkey. something my mom always has done. WHOLE ROASTED THANKSGIVING TURKEY WITH MUSTARD GRAVY would be perfect since it can be used for a festive dinner, and then the leftovers can be used throughout the week to make other meals or can be frozen. The turkey tacos would be a great meal for my family! The CHEESY TOMATO AND TURKEY BAKE looks delicious. My family would definitely enjoy it. Slowcooker turkey breast would be perfect as my family is always on the go , but I would love to try deep dried turkey too . The Sausage and Pistachio Stuffed Turkey Breast Roast provides a great meal solution since it is a great source of protein and is something everyone in my family likes to eat! Cook at a higher temp for about 30 minutes. The recipe for Slow Cooker Turkey Breast is what I am doing this weekend because we are camping and being able to cook the turkey in the slow cooker is great! the turkey tacos are something my kids would love and yay for food they can hold with their hands! The Caesar Turkey Schnitzel Sandwich would be a great meal solution for my family because it would be a quick , simple, and delicious meal. The smoked turkey wraps are a great solution as they are quick to make and everyone likes them! I will have to try the shredded turkey tacos. My best turkey tip is to marinate it is a good brine.1bulb garlic,1lemon sliced 25pepper corns,2cup salt 1/2 cup sugar and enough water to cover the turkey. Turkey Tacos sounds like a delicious meal that the whole family would love. Also easy to make! The Smoked Turkey Wraps would be great for my family because we could choose our own toppings and make our own wraps! The kids love the be involved in making dinner. We are getting a fresh turkey this year and stuffing it with mandarins and rosemary! Looking forward to it! Whole roasted turkey for us! We have a ton of people so we need it. The smoke turkey wraps seem easy to prepare. The SQUASH, TURKEY AND ZUCCHINI SOUP sounds yummy. I bet it would be great to freeze up for those super busy nights! I like the turkey taco pizza recipe as pizza is something everyone can agree on and enjoys! the shredded turkey tacos would be great for our family because everyone loves tex mex. The Cheese and Tomato Bake turkey is on my list because we eat a lot of cheese. My whole turkey cooking tip is to place butter under the skin of the turkey the day before you cook it. SQUASH, TURKEY AND ZUCCHINI SOUP looks like winter time comfort food. Another tip I do is to cook the turkey breast side down so all the juices run into the white meat. I like the shredded turkey taco recipe. Perfect for Taco Tuesdays at our house! My best tip is to use a deep fryer. The skin comes out so crispy! I put 3 slices of bacon on my turkey when cooking. It add some flavour! I love the idea of the turkey tacos! Those sound amazing and perfect for my big and little picky eaters. I like to use a fresh turkey for best results. My best cooking whole turkey tip is to buy a cook from frozen turkey, so easy and much safer food safe wise. When I am cooking a whole turkey I always buy a fresh one, I find that they taste better. Our family loves healthy and nutritious meals! Cheesy tomato one and turkey bake sounds really awesome! I like the CLASSIC ROASTED HALF TURKEY recipe. My tip is to defrost your turkey for a week in the fridge before cooking it. I like the turkey taco pizza recipe from the site as pizza is ALWAYS a hit with everyone! Slow cooker Tiurkey Breasts in the crock pot sounds like a moist delicious idea. Use a thermometer to insure turkey is properly cooked. Cooking a whole turkey – low and slow. I baste often and always add more liquid. My favourite turkey recipe is on the stove right now! Simple turkey soup. It makes a TON of food, enough for days and its super healthy! YUM! Rub your turkey with butter to get a nice brown finish. I love the turkey chili slow cooker recipe…anything that makes a worknight dinner easier is gold in my books! A perfect recipe for us would be Honey Garlic Turkey Tenders with Sweet and Smoky Dipping Sauce! Turkey Soup ! Love that after our big thanksgiving meal ! We cooked our turkey covered in bacon strips! It bastes itself that way. Not the healthiest thing, but Thanksgiving is only once a year! WARM TURKEY AND ROOT VEGETABLE SALAD WITH GOAT CHEESE DRESSING would be perfect for my family because we love all the ingredients !!!! Nutritious and an enjoyable meal for everyone! The shredded turkey tacos woldl be great for us. We all love tacos,,it is a family favorite,and we can eat them for a quick snack,lunch of supper! Last year I made my turkey with a mayonaisse rub. I was quite skeptical, but it was awesome…very moist and tasty. Best turkey ever. My family would love the sweet and spicy turkey drummettes and they would really enjoy the glaze too. I like the turkey tacos because my kids loves taco and a great way to use up leftovers. My best tip is—get my husband to do it. Seriously I have never cooked a turkey because he is such an amazing cook! I am spoiled! The turkey pot pie! That allows me to create a whole different meal using leftover turkey and veggies. The CHEESY TOMATO and TURKEY BAKE is perfect for my family because we have several picky eaters in our group, but everyone of us loves the ingredients in this recipe! I love the looks of SQUASH, TURKEY AND ZUCCHINI SOUP as a meal solution. We love soup and this one combines favourite ingredients and flavours. Anything with spinach makes me happy. I use an electric roaster oven for the turkey to save room in the oven for the potatoes and sides. BATCH TURKEY MEATBALLS would be perfect for my family because the kids love any kind of meatballs! Caesar Turkey Schnitzel Sandwich is a great meal for my family as it is easy to make and satisfying. Turkey and goat cheese? Yumm! The Deliciously Simple Herb Roasted Turkey has the flavour my family loves and makes great sandwiches and casseroles as leftovers. Would like to do turkey tacos with our leftovers to get a bit of variety. The turkey tacos are fast and easy to make. I find basting the turkey makes it brown nicely. I love a one-pot meal – the CHEESY TOMATO AND TURKEY BAKE sounds perfect! The Squash, Turkey and Zucchini soup because we like lighter healthy meals. Slow cooker turkey breast since we usually only eat white meat in this house! The Batch Turkey Meatballs are great to make in bulk so you can freeze for future meals. And the family loves them. I have to say i am very surprised they have such a large selection of recipes and most ingredients needed i can find in my home.Another recipe i would love to try for my family is the SPICY PEANUT NOODLES WITH TURKEY,we do love spicy dishes. The Cheesy Tomato and Turkey Bake would be a great family meal solution as it would stretch out the great turkey leftovers for another yummy meal! Cheesy Tomato and Turkey Bake offers a delicious one-pot meal for a hearty lunch or the main dish for supper and we all love turkey with anything! Pasta dishes can get boring so I really like this unique CHEESY TOMATO AND TURKEY BAKE! I like that it uses lower-fat cheeses for a healthier family meal. Smoked turkey wraps would be a delicious and healthy lunch. My pick is the Turkey Apple Meatloaf muffins, because I like the portion ease of meatloaf muffins, and this is a nice twist on my usual recipe. Everybody loves turkey here ! GRILLED TURKEY TACOS would be great for our family . This is something we could start preparing ahead of time when all 4 kids have activities ! The grilled turkey tacos look easy and something my kids would love. 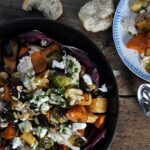 The Warm Turkey and Root Vegetable Salad with Goat Cheese Dressing would be a perfect meal for our family, because not only is it economical, but so healthy, too! I like the Cheesy Tomato and Turkey Bake. Sweet % Spicy Oven Fried Turkey Drummettes sounds perfect for a family dinner at home. I love cooking the entire meal in the oven. Add a quick green salad and serve! The turkey tacos would be a great recipe for our family because we love tacos, and using turkey is a healthier option. I like the turkey taco pizza recipe as pizza is always something everyone can agree on and enjoy! Turkey Tacos provide a great solution as we all love turkey and tacos in our family! The SPICY PEANUT NOODLES WITH TURKEY looks amazing. Good for my family, quick and yummy. PEACH GLAZED ROASTED TURKEY BREAST would be a wonderful meal for my family ! I cook my turkey slowly. I rub it with butter and seasoning and it is so yummy and juicy. i know my children would love the turkey tacos on our taco tuesdays! Turkey wraps are something my whole family loves ! The turkey tacos look awesome! My kids would love those! The TWICE BAKED TURKEY DIJON BAKED POTATOES is the perfect side dish to make with leftover turkey after Thanksgiving! Great that the bacon can be substituted for turkey bacon to double the turkey taste! Yum!